LightSheer DUET laser is a quick, easy, permanent hair reduction. 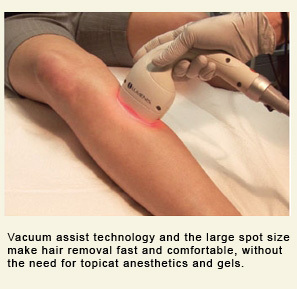 The High speed LightSheer DUET uses state-of-the-art diode lasers with vacuum-assist technology to remove unwanted hair and with greater speed and comfort than other methods. The LightSheer DUET now offers two handpiece options to allow more rapid and comfortable treatment. With the larger handpiece the back or legs can now be treated in 15 to 20 minutes with minimal discomfort. LightSheer DUET is a safe hair removal option for all skin types. 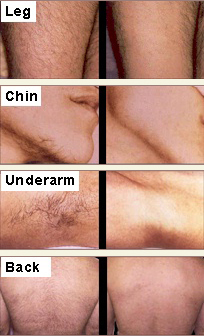 Laser hair removal requires multiple treatments. Packages are sold for 6 or 9 treatments and discounts are offered for two or more packages.